Impervious surfaces such as rooftops and driveways have replaced healthy soils and natural plant communities that once readily absorbed rainwater. The resulting runoff contributes to water pollution, health challenges and property damage. You can landscape your yard for both beauty and function. Address specific water issues on your own property such as erosion, wet areas of the yard and difficult-to-mow places, while positively impacting your neighbors and area streams as well. Use our Benefits & Goals Checklist to clarify which rainscaping benefits are most important to you. What Do You Know About Your Site? 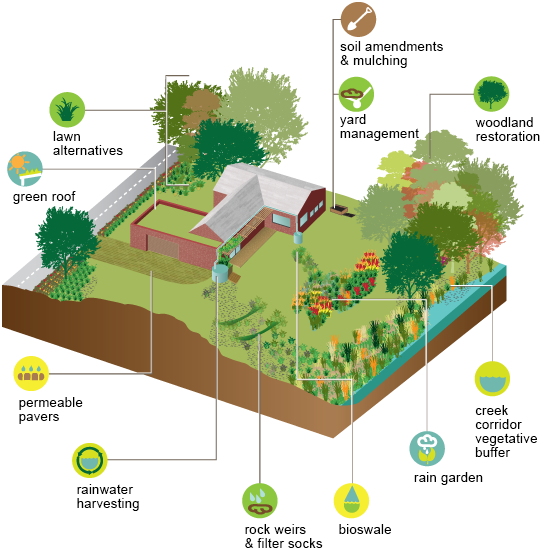 Is a Rain Garden Right for Your Site? The Missouri Botanical Garden Rainscaping Guide is partially funded by the Mabel Dorn Reeder Foundation and US EPA Region 7 through the Missouri Department of Natural Resources (subgrant number G11-NPS-15), under Section 319 of the Clean Water Act.